Computer monitors only go so far in representing the colors and textures of product. Screen resolutions, lighting, scans and photography cannot give a completely accurate representation of color, texture and size. The Taiwan Zipper Manufacturer's Association (TZMA) color card is the industry standard for polyester zipper tapes. 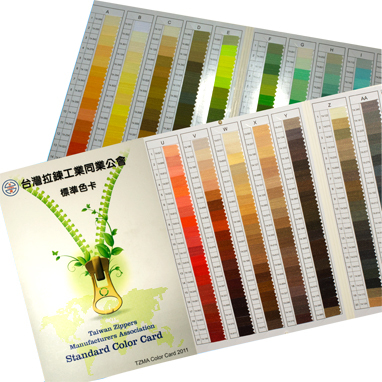 There are 600 actual color swatches of which ZPRZ COMPANY keeps over 100 colors in stock at all times. An exciting new addition to the ZPRZ® family is the Metallic Coil stocked in 20 colors on black tape in both finished lengths and chain as well as 3 colors on metallic lamé tape. Vive la Différence! The two-set Metal Finishes cards show 23 actual samples of teeth and pulls in fashion forward finishes. The ZPRZ® metal teeth and pulls are specially engineered to work together.